The tomb is provided with a long dromos, 9m in length, leading to a circular chamber, 5,90m in diameter, with a plastered floor. 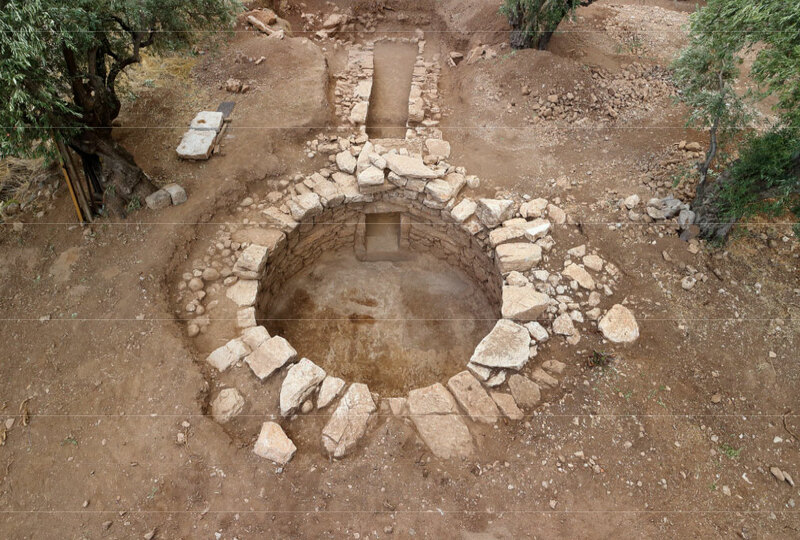 In 2014, during a public irrigation project, the local Archaeological Service at Phocis excavated a tholos tomb, in the area of Elaion, at a short distance from Amphissa, on the slopes of the Amblianos hill, at the east end of a fertile coastal plain, extending all the way out to Kirrha. The tomb is a unique find in West Locris and one of the few funeral monuments of this type in Central Greece. Dr Elena Kountouri (head of the Directorate of Prehistoric and Classical Antiquities, Ministry of Culture) will present the tholos tomb at the site of Amblianos in Amphissa, in the framework of the Mycenaean Seminar series. on November 24, 2016 (6.00 p.m., in the A. Argyriadis Amphitheatre, Central building of the University of Athens, Panepistimiou 30). The tomb is provided with a long dromos, 9m in length, leading to a circular chamber, 5,90m in diameter, with a plastered floor. Although the superstructure of the tholos, built with slab-like stones, has collapsed, the walls of the chamber are preserved to a height of almost 3m. The finds indicate that the tomb was used for more than two centuries, from the 13th to the 11th c BC. Inside the funeral chamber a large quantity of osteological material was found, mostly from secondary burials in the centre of the tomb and around the walls of the chamber. Among the finds is included a large number of pottery vessels, of type-Phi and Psi figurines, weapons, and a large quantity of jewellery, beads of semi-precious stones, and sealstones depicting animal scenes. Every once in a while the relatives must have cleaned out the burial chamber, throwing out earlier offerings to the dead, especially pottery, into the dromos or in an apothetes sealed with a low wall, at the end of the dromos. This practice resulted into the gradual rise of the floor level of the dromos and in the construction of a small staircase before the entrance of the chamber, to facilitate access to the latter. In the apothetes were discovered mostly drinking vessels and vessels for mixing liquids, some of which stand out for their pictorial decoration. The association of the apothetes with a neighboring platform and with funeral rituals in general is quite attractive. It should be emphasised that the study and presentation of this unique burial group is most important for the study of the Mycenaean period in north Boeotia and Phocis, areas for which there are few publications and often only in the form of preliminary excavation reports. Both the quality and the quantity of the pottery and the other finds from this tomb are important additions to the small, known group of examples from the neighboring sites of Kirrha, Krisa and Delphi, throwing light on a number of issues concerning local production of pottery and of small artifacts. In addition to that, the tomb provides important information about the topography of the area and the commercial and cultural contacts of the local community, lying in the periphery of the Mycenaean world, adding fuel to the question concerning the use of this type of monument by the local elites. Apart from the central position occupied by pottery, as our main source of information, which is the case in most Mycenaean cemeteries, also important is the newly discovered group of sealstones, mostly of the Popular Mainland Style, depicting simplified animals, often next to branches or trees and dated to the last periods of Mycenaean seal-making (LH IIIA2-LH IIIC). Among the figurines, another interesting group of finds, is probably included part of a bull leaper, similar to that discovered at Methana. Among the clay finds were also identified miniature pieces of furniture, including a three-legged open chair and parts of two other constructions, which could be interpreted as offering tables or even as funeral biers. Finally, worth mentioning is the large number of bronze rings and hair coils. The overall picture concerning the burial customs and grave offerings in the area is completed by a small group of weapons, bronze vessels and objects made of gold, faience and glass paste. The study and the publication of this tomb is the result of collective work by a multi-disciplinary group of scholars, co-ordinated by the speaker.